Cup on the Bus: Janice loves to quilt! You know my sister quilts; I’ve said something about her and quilts from time to time. Click on Janice over in labels and you’ll see how often! Even before this country joined World War I, the international and American Red Cross organizations were involved as ambulance drivers, and hospital staff. 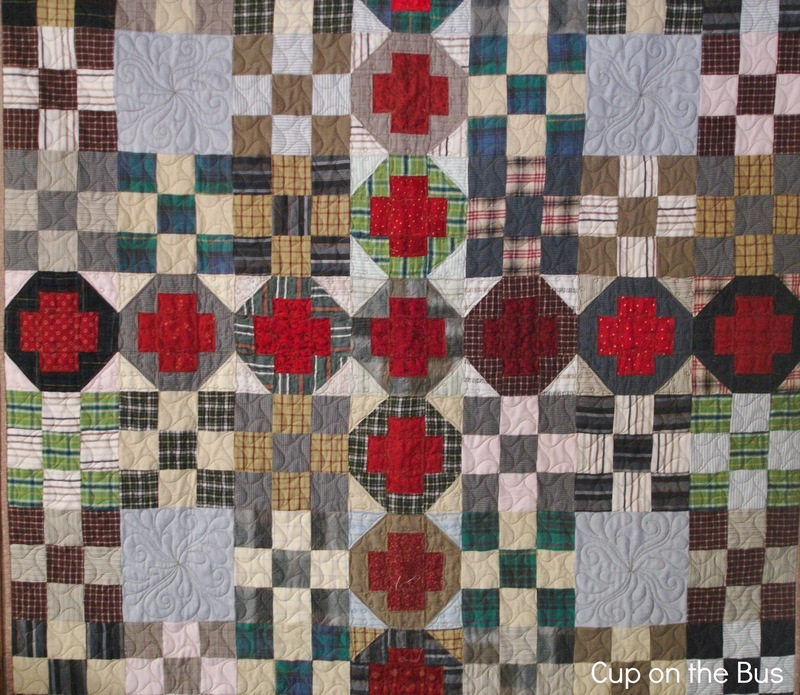 Red Cross chapters raised money by making and raffling quilts, many with a red cross theme. One of Jan’s current methods involves making quilts from old shirt fabrics. She and her friend Patty shop thrift stores for men’s shirts, and spend chatty evenings cutting them into useable parts. There also is a steady stream of beautiful shirts from my son-in-law, who wears through the right elbow of his dress shirts in short order. 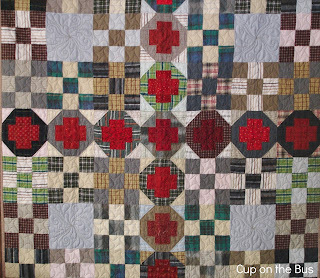 This quilt pattern has been around in one form or another as a tribute to Clara Barton and the Red Cross. Jan made it from her salvaged shirt fabrics. Give her a look: Janice loves to quilt. Blogging is contagious. Her quilt is beautiful. Using old shirts is what Joe's mom used to do. Buying fabric was unheard of back then. My grandma used to take worn clothes to make quilts. I once worked on a quilt with my ladies circle from church. It was a log cabin design and we were making it for our church bazaar. It took many weeks and I have never worked on another quilt--it's hard work! Your sister has a super blog....I only ever made one quilt...and now I have the time I don't have the eyesight for it to be pleasurable..so I'll enjoy hers! That is a beautiful quilt . I've always admired quilt makers. I think I deserve a medal if I HAVE to sew on a button! It's a lovely quilt and I love the fact she is repurposing expired clothing. Thanks for the link. I've added her blog to my reading list. Enjoy your week and have a wonderful Thanksgiving. I have several old quilts that my great aunt made. Some are pretty threadbare and ragged on the edges but we still use them. I myself have never made a quilt though I did start one once. How lovely, Joanne. Thrift stores are great for finding a host of items. I love quilts, but I'm hopeless at making them. I only ever made one, a pram quilt for my third baby, from old maternity dresses. Just biggish, same sized squares sewn together. She still has it and she's 36 now. Wonderful to incorporate old materials into new quilts, I love fabric and piecing but haven't done it for years. Looking forward to her Janice's blog. What a lot of tiny blocks there! I like the thought of using discarded clothing to make something new, as well. I remember my grandmother quilting when I was much younger and I see the many hours and dedication put to the work! Your sister is very talented! Joanne, just read your comment on my blog- I left Wales to be with THe Pirate....simple!! I have a friend who had a spell of making beautiful cushion covers from old shirts. You would not think it would work, but they were lovely and she sold them all at the market. I think she could have continued selling them, but she got tired of them (or maybe she ran out of old shirts) and started to make something else after a while!